As a huge fan of Faith Hunter's Jane Yellowrock series, I was hesitant to begin this sister series for reasons I cannot fathom. Blood of the Earth is the first in the Soulwood series and can be read independently of the Jane Yellowrock series without any confusion. There are mentions of events, which happened in the Jane Yellowrock series, but enough information was given to clear up the whole of the events, without info-dumpage. Ricky. Ricky. Ricky. The reader gets the absent from the Jane Yellowrock ex-boyfriend Ricky in the Soulwood series, and that makes it completely worth it. I want to applaud Faith Hunter for creating two completely unique, independent, original heroines in Jane and Nell. One of my fears was simply that they would sound similar, the writer's voice, but other than an independent streak and a need to protect, Jane and Nell have nothing in common. Nell is an ex-member of a cult-like church that engages in polygamy, with its core tenet as women being a helpmate to the men in their lives, with zero autonomy. Nell legally married an older man (which is not done in the church, as the church legally owns all assets upon death), who also defected from the church with a wife he married via the church. After his first wife died, Nell then nursed her husband through his own bout of illness, which left her as a widow. Years later, still a young woman in her early twenties, Nell is now a widow, with the mentality of a middle-aged woman. She isn't one quick to laugh, nor does she crave any frivolities. As for romance, what's that? The concept is foreign, feeling more like a lie or fantasy written on the pages of a romance novel. It was simply a wife's duty, one in which she was taught not to enjoy, when she was only fifteen to an ailing, older husband by decades. While legally hers, Nell still calls the house her husband's, with the belongings that of her sister-wife. She still sleeps on a cot in a cubby, where she has slept since she was a fourteen-year-old child nursing her sister-wife. Not taking either bedroom in the house, as if she doesn't deserve it. She doesn't allow herself to feel pride and ownership, the mindset the church instilled in her. Owning a large piece of property and a farmhouse, butted up against Church lands, the church wants to control Nell through another marriage, to where the husband would now have control of the property, giving it to the church. Large portions of the novel, particularly the beginning, Nell is fighting the males of the church, who think they can take her and her property by force. She fights this, not because it's her property, but because she knows her passed husband wouldn't want the Church to have control of his property. Those males believe if they touch her, she's theirs, and they don't care if they have to kidnap and do bodily harm to Nell to get what they want, as women are far beneath them. No man stands up for the women in their families, allowing them to be punished by higher ups in the church who simply wish to have them, which I found a bitter pill to swallow, many times having a difficult time reading because of this. Women who had a brain cell in their head, they would be taken from their husband and family to be 'used' and abused by other males, to teach them to act as a woman should. I found this accurate, difficult to read, but confusing as to why their husbands/fathers took no issue to this practice, as purity was the only thing women had to offer. Why didn't the fathers care when their child-aged daughters were taken as bed warmers, not wives? In their way of thinking, this would be disrespectful to the father/husband, an insult given, as these women were their possessions. This, I know happens in cults, but that mindset is so contradictory to their teachings. Townie girls go missing, and associates of Jane Yellowrock appear on Nell's property, much like they did previously (these previous events tying everyone together happened in a Jane Yellowrock book, but it's told in a non-confusing way for new readers). Nell becomes a consultant, trying to help solve the kidnappings, while struggling to maintain the life she has been living. Heavily influenced by the Church, the off-the-grid living conditions, and the rural mentality, Nell is an original character, one of the most unique I've read to-date. She has an affinity to earth, the land beneath her feet feeding from her while simultaneously feeding her. It was beyond intriguing to see how Hunter connected this affinity to the sleuthing and paranormal aspects. It was a joy to watch Nell blossom into who she should be, alongside seeing the changes in her family, with the added bonus of Rick and his team. I've already started the second in the series, and so far find it just as intriguing and original as the first. 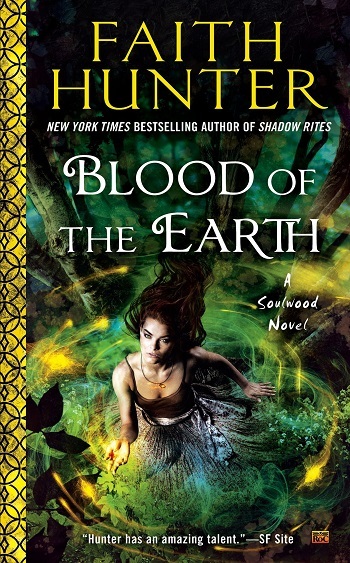 Erica reviewed her personal copy of Blood of the Earth (Soulwood #1) by Faith Hunter for this post.